Danny Royer of the Red Bulls battles Chicago's Bastian Schweinsteiger. @NewYorkRedBulls. 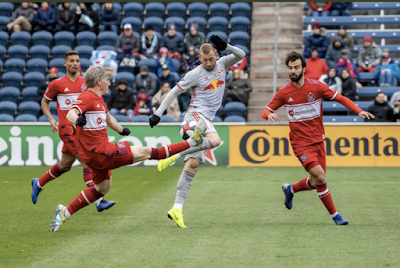 It was a tough weekend for the New York-area MLS teams on the road, as the Red Bulls lost a tough one to the Chicago Fire, 1-0, on Saturday afternoon, while NYCFC lost 4-0 to Toronto FC on Friday night. The Red Bulls drop to 1-1-2, with 4 points, on the season, and are in eighth place in the Eastern Conference. NYCFC is still looking for their first win on the season, as they are 0-3-1, 3 points, and in 11th place. The only goal of this match at SeatGeek Stadium in Bridgeview, Ill. came in the 48th minute when a shot from Nemanja Nikolic rang off the post and bounced into the the Red Bulls' goal off of center back Tim Parker, who was tracking back on the play. This was the Red Bulls' second straight loss, and it is the first time the Red Bulls have lost back-to-back regular season games since May of 2017. Kemar Lawrence made his MLS season debut after returning from a knee injury. Lawrence missed last week's match while on international duty with Jamaica. Kaku, Aaron Long, and Michael Amir Murillo also returned to the starting lineup after being with their national teams last week. The Red Bulls are back home to host Minnesota United FC next Saturday, April 6. Kickoff is set for 7 p.m.
Alex Pozuelo led the way for Toronto FC, as he scored two goals on the night, in the 58th minute and via penalty kick in the 78th minute. Jozy Altidore opened the scoring for Toronto FC in the 29th minute. Jay Chapman put the icing on the cake when he scored in the 83rd minute to make it 4-0 Toronto, which was the final.